Lehman Brothers, the fourth-largest US investment bank, has filed for bankruptcy protection, dealing a blow to the fragile global financial system. The news led to sharp falls in share prices around the world, and officials took measures to reassure markets. Lehman had incurred losses of billions of dollars in the US mortgage market. Merrill Lynch, also stung by the credit crunch, has agreed to be taken over by Bank of America, the latest twist in a dramatic turn of events on Wall Street. The Dow Jones Industrial Average ended more than 504 points lower on Monday, marking its biggest fall since the September 11 attacks. The Nasdaq composite index shed 3.60% to 2,179.91 and the Standard & Poor's 500 index lost 4.71% to 1,192.70. 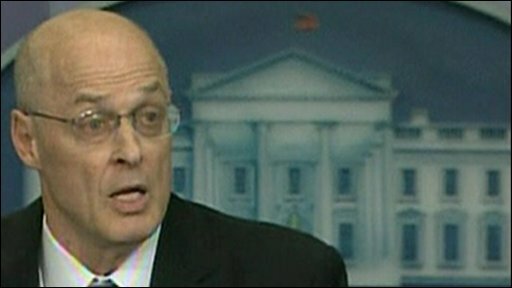 US Treasury Secretary Henry Paulson said the US was "working through a difficult period in our financial markets right now as we work off some of the past excesses". But he added: "The American people can remain confident in the soundness and resilience of our financial system." However he warned that uncertainty remained and it was likely that there would be further "rough spots" ahead before the market was corrected. Turmoil would continue in financial markets until the housing correction was completed, he added. Mr Paulson said he was committed to working with regulators in the US and abroad, as well as policymakers in Congress to take the necessary steps "to maintain the stability and orderliness of our financial markets". But he gave no details of what such steps might mean. Earlier in the day President George W Bush said: "In the long term I am confident that our financial markets are flexible and resilient and can deal with these adjustments." Stock markets and the US dollar have tumbled in reaction to Lehman's collapse, with banking shares hardest hit. HBOS shed 17.6%. Central banks have moved to reassure markets. The US Federal Reserve has broadened its emergency lending scheme and the UK and European central banks have injected a total of about $50bn (£28bn; 35bn euros) into the financial system. There are fears AIG, once the world's largest insurer, could also face collapse. It is taking steps to raise money after reportedly seeking a $40bn emergency loan from the Fed. Bank of America's move to buy Merrill in a $50bn deal means that three of the top five US investment banks have fallen prey to the sub-prime crisis within six months. In the UK, accountants PricewaterhouseCoopers (PWC) have been appointed as administrators for Lehman. PWC told a news conference in London that it is unclear whether Lehman's UK staff will get paid the $75m (£42m) that they are owed in wages this month. "When we took over this morning, there was no cash in the company," said Tony Lomas from PWC. "We still don't know what the position is - we will tell staff as soon as we know if we can, or if it is appropriate to pay staff on Friday." In response to a question from a journalist he agreed it was extraordinary for a company like this to collapse. "What it underlines to me is the importance of market confidence," Mr Lomas said. "If no one wants to trade with you...there's no way back." Analysis: An end to bank bail-outs? Stock markets in Europe and Asia have dropped sharply and the dollar tumbled against the yen, the euro and the Swiss franc as Lehman's failure raised fears about the strength of the global financial system. The FTSE 100 index of leading UK shares ended down 212.6 points or 3.9% to 5,204.2. To help stabilise the money markets, the Bank of England and the European Central Bank pumped in £5bn and 30bn euros respectively. In addition, the Federal Reserve said that for the first time it would accept stocks owned by banks as collateral for short-term cash loans, broadening its emergency lending programme. 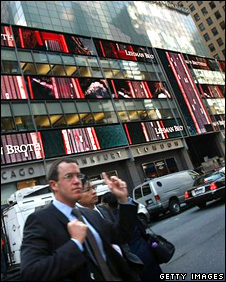 Lehman Brothers filed for bankruptcy protection after a weekend of frantic activity on Wall Street. Barclays and Bank of America had been in talks to rescue the bank, but negotiations faltered when it became clear that the US Treasury was opposed to using government money to help seal a deal. By Sunday evening, staff at Lehman's headquarters in New York were leaving with cardboard boxes as onlookers gathered to watch the bank's demise. "I think the whole history - 150 years of effort and hard work - that's the most saddening part for me," said one Lehman employee as she left the building. The bank, which employs about 25,000 staff worldwide, including 5,000 in the UK, was founded in 1850 by three brothers. 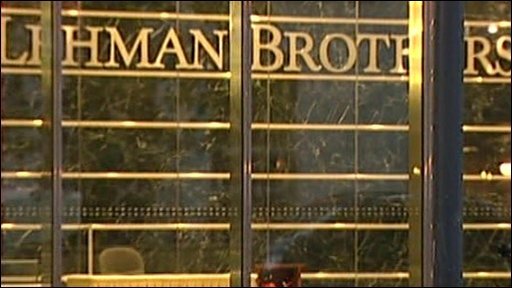 Lehman Brothers filed for Chapter 11 bankruptcy protection, which allows a company time to reorganise and devise a plan to pay creditors over time. It said that its broker-dealer division and asset management division Neuberger Berman Holdings would not be included in the filing. On Monday, US Treasury Secretary Mr Paulson said he "never once" thought it would be right to use taxpayer's money to solve Lehman's problems. Separately, Bank of America said it had agreed to buy investment bank Merrill Lynch for $50bn (£28bn), in a deal that will create the world's largest financial services company. Three of the top five US investment banks have now fallen victim to the credit crunch. Lehman and Merrill join Bear Stearns, which was sold to JP Morgan for a knockdown price in March. The BBC's business editor, Robert Peston, said that it had been Wall Street's most extraordinary 24 hours since the late 1920s. He said that Merrill's sale was almost as shocking as Lehman's demise. "The global financial economy has never in recent years been tested by quite such a combination of accidents and jolts to confidence," he said.